The cover for the latest issue of Doctor Who Magazine has been revealed, featuring three of the Doctor’s best known and most enduring foes, the Daleks. This month’s issue of the publication, out later this week, features an exclusive interview with Beryl Vertue. The producer – and mother-in-law of former Doctor Who showrunner Steven Moffat – discusses her time as agent in the 1960s for writer Terry Nation, perhaps best remembered as creator of the Daleks. The new issue also sees Peter Capaldi reflect on his time as the Twelfth Doctor. The actor left the role during last year’s Christmas special Twice Upon a Time, just over four years after his surprise cameo in the show’s 50th anniversary special The Day of the Doctor. Also included in this month’s issue are interviews with comedian and Strictly Come Dancing star Susan Calman, whose Doctor Who writing debut will feature as part of a new all-female short story collection out next month, as well as Red Nose Day director Emma Freud, whose recent ‘Breakfast of Doctors’ event raised over £600,000 towards the charity’s projects. 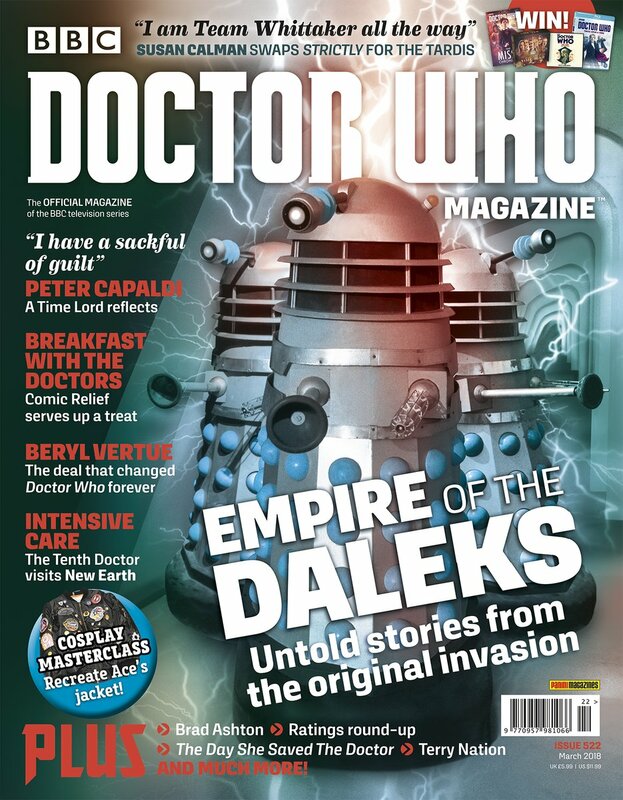 Doctor Who Magazine #522 is on sale from Thursday 8th February, priced £5.99.